Wow, it got cold fast. 48ºF/9ºC as I write this at 8:50 am. Hence the scarf. That’s no ascot or neckerchief, that’s my grandfather’s silk scarf from the 1930’s. Silk is good for days like this. Scarves are good for the smart casual look. I bring up smart casual as I have come to realise that many of my readers live in places that are far warmer year-round than Richmond, VA. With the proper tailoring and a bit of forethought any man can look more elegant in his suit. But what about that tricky middle-ground dressing that predominates in places like California? That’s a tall order for me to fill. I am a staunch supporter of the sport coat, suit, dress shirt and tie. And don’t get me started on shoes. I also find it very difficult to live in khakis; but, I am what used to be called a clotheshorse. Still, there is a need evident. Let’s try and puzzle it out together. I’ll start by recommending a polo neck sweater like the one I’m wearing in the photo above. I find it the most versatile of the sweater styles. It can frame a shirt and tie like a v-neck. It can stand alone like a tennis shirt/sweater when worn with a t-shirt. It can layer over an open-necked shirt. This one is navy blue, merino wool. I own similar sweaters in cashmere and silk in a number of colours. For the warmer climes you might find one made of singleply cashmere or a blend of cotton and silk more comfortable. I’d even suggest a stronger colour. I have a Johnny collar version from Ben Jones in a lime green that I love. The stronger colour lets you wrap it around your neck like a scarf when the temperatures rise in the afternoon. And in the warmer states, strong colour isn’t something that has to be shied away from. The key to the trouser is to keep it dressy by keeping it dark. Grey and blue are much nicer than black. I also think that you have two choices when it comes to the fullness of the trouser. I think either will work fine. Just make sure that you have them rigourously tailored to fit. Flat fronts do seem to stand alone better than full cut pleated trousers that pair nicely with tailored jackets. My flannels today are cut with a fuller leg (21″ at the knee and tapering to 18″ at the ankle if I recall correctly), but are flat front with a standard rise and side adjusters. I’ll be thinking a lot more about smart casual, but would love to hear your thoughts. Women have it a bit easier in this department as they have been mixing and matching separates forever and a day. This entry was posted in Elegantology and tagged Ben Jones, Rubinacci, Smart Casual, The Rake Magazine, Zanella. Bookmark the permalink. Looks VERY sharp. 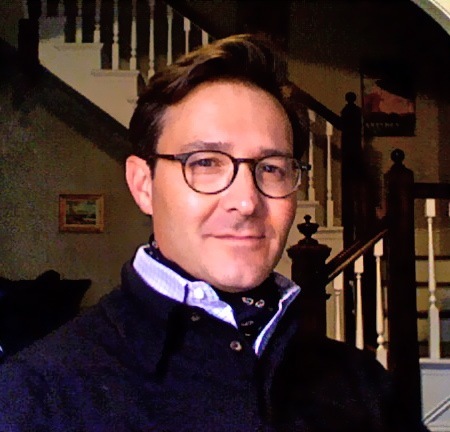 I have declined to purchase a few scarves lately because I was afraid I’d look “flamboyant” or Thurston Howell-ey, but you’re pulling it off with a clean, modern, masculine esdge – way to go! I suspect the reserved palate and weather-appropriateness go a long way in keeping it that way. What are the dimensions of the scarf, and how much ends up tucked down the shirt front? I’m making only a brief cameo in the office today, so casual for me means heavy-weight camel colored trousers, white w/french blue pinstriped french-cuffed button-up and BRIGHT magenta tie, with only the knot, collar and sleeve ends visible under navy cashmere v-neck and navy sport coat. The pocket square is straight-edged today and the shoes are “cigar” colored cordovan with a Norwegian split. Thank you Cap’t. It’s a standard sort of silk scarf, about 36″ long. I wrapped it twice and once through. The fringes barely made it under my collar. Your casual attire has given me a thought for a future post, too! Thanks. I’ve been doing wool slacks, tweeds, etc, with simple sweaters or twin sets. Skirts in the same fabric, with stockings or patterned tights, lots of layering and loafers–Charm City is freezing today!! If I ever have a son I am going to make your blog required reading. This look is so chic and classic- it brings me back to the old films I love- Cary Grant/ Gregory Peck. Bravo! I like the polo collar. It’s a more finished look. The v-neck is a little too close to many employer selected uniforms. The right tie makes the difference with the v-neck, but I still feel like I’m impersonating the boss in some settings. I was making preparations for the colder seasons today as the first rains fell yesterday, here in Los Angeles. a hat brush was priority #1 as I’m not one to carry an umbrella but opt for a 2″ brim in felt and a good coat. the other was a pair of trousers in twill woven cotton in a color called light stone. with the kind of work I do I need something that I won’t need to worry about tearing or being damaged. I keep the wool and flannel for dressier occasions like dinners luncheons. the polo sweater never occurred to me. I’ll keep an eye out for those when I hunt for some new scarves. It was a little warmer (just a little!) than that here in SC today, but I had he scarf under the simple grey sweater today. Cheers! Very nice look, as always. Love the sweater. Smart casual? Well, there are so many ways to go about it. I have taken to wearing ascots as one approach. Functionally, there’s no difference between an ascot and a silk scarf the way you’ve worn it. On colder days, I put a V-neck vest or sweater over my shirt and under my jacket. The contrast of colors, textures, and patterns is part of what makes the look work, I think. Down below, cotton pants, argyle socks, and burgundy & black saddle shoes are a great casual-yet-smart contrast to the smart-yet-casual ascot. Great look! I like the fact that you took some simple elements, combined them and made them your own. Does go to show that “casual” doesn’t have to mean “sloppy”. This look is very well put together. Yesterday, a polo neck sweater was my garment of choice as well. I rely heavily upon the polo neck, vests and cardigans for smart casual, especially when wearing plaid or patterned shirts.